George Graham Reviews "Eileen Ivers and Immigrant Soul"
Cross-cultural fusion is one of the more active area of musical creativity that's taking place under the radar of the commercial music business. Some of the most interesting music that is being generated these days comes when people mix previously disparate genres. Of course, there's always the danger that the styles to be combined will be incompatible, or the way they are put together not skillful, but it's often fun hearing artists try, and the listening rewards considerable when they succeed. This week we have a CD that's a great cultural fusion and is also a lot of fun for the most part, though it's not the first time that these particular ingredients have been stirred together. 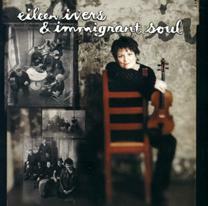 The group and recording are both called Eileen Ivers & Immigrant Soul. Eileen Ivers is a veteran Irish and Celtic style fiddler, and her new CD combines that with World Music styles from Africa and South America for an infectious blend that is frequently danceable and almost always interesting. Though she is associated with Irish music, Ms. Ivers was born and raised in the Bronx of a family of Irish immigrant descendants. She took an early interest in Celtic traditional music, starting to play at age eight. Despite an academic direction majoring in mathematics, and some work in the field, by her teens and early 20s, she represented the U.S. at the all-Ireland music competition and took the championship on the fiddle seven times. She played fiddle in the "Riverdance" production, was a founder of the group Cherish the Ladies, and has worked with symphony orchestras, including the Atlanta and London Symphonies, as well as the Boston Pops. All told, she has been on about 75 albums, and a number of film soundtracks. After her widely-praised CD Crossing the Bridge, Ms. Ivers has gone wholeheartedly into the cross-cultural fusion mode on the Immigrant Soul CD. She points out that the recording is a kind of representation of her multi-cultural neighborhood in the Bronx, where Latino and African-American culture, and her Irish background mix freely on the streets. Her band combines African and Latin percussion with her fiddle, a funky bass, keyboards from acoustic piano to synthesizers, plus some blues harmonica. The styles are blended with abandon, but also with a lot of musical adroitness, with the fun that the musicians had in making the CD quite obvious and infectious to the listener. Her band includes Tommy McDonnell, who plays the harmonica and does the vocals in a voice that would be at home on Broadway; Donal Clancy, John Doyle and James Riley on the various guitars, Emedin Rivera on percussion and Leo Traversa on bass. There is a large cast of guest musicians including South Africa bassist Bakithi Kumalo, who was known for his work on Paul Simon's Graceland album; Jerry O'Sullivan on the Uillean pipes, and Ben Wittman on drums. This is certainly not the first time these various musical influences have come together. The Afro-Celt Sound System and Mouth Music pioneered mixing Celtic with African and funk beats; and last year Rubén Blades created a CD called Mundo, that combined Latin sounds with various world music styles, including a good deal of Celtic influence. But Ms. Ivers' release is one of the more wide-ranging coming from a Celtic perspective, and is certainly one of the most fun CDs in the cross-cultural fusion mode to come along in quite a while. A fair amount of the material started out as traditional tunes, though the arrangements are anything but traditional. While the emphasis is on instrumental music, there are several vocal pieces that are as wide-ranging as anything else on the CD. Eileen Ivers & Immigrant Soul may not be the first fusion of Celtic with everything from Latin to blues, but overall it's quite innovative, and unlike many such ground-breaking stylistic fusion efforts, this CD can be a lot of fun. The arrangements are creative and the musicianship top notch. If there is a small criticism it is that the tunes are basically one idea each, with not a lot of variation within each track, something that was quite present on Rubén Blades CD last year. The variety across the CD, though, is impressive. For a style that is supposedly traditional, Celtic music has come a long way in recent years. Eileen Ivers & Immigrant Soul, in their CD of the same name have torn down even more boundaries, and in the process made a thoroughly enjoyable recording.